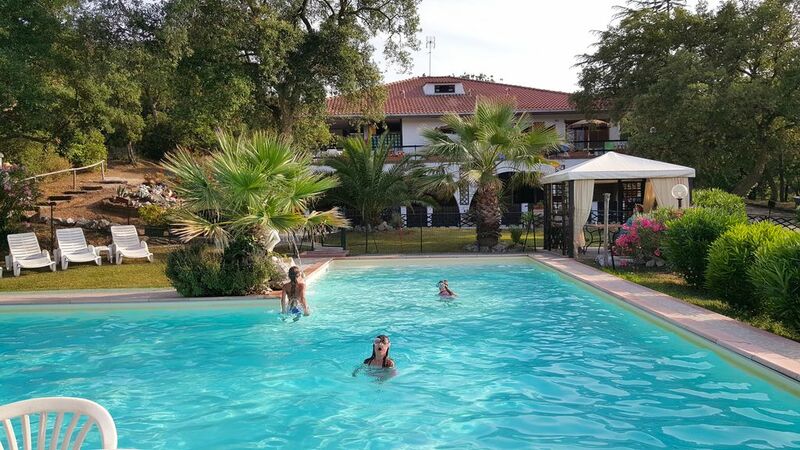 In Tuscany, at Campiglia Marittima we offers holiday apartments by the sea, completely immersed in 3 hectares of beautiful natural park with a 15 x 12 m swimming pool and private parking. Available for all are: barbecues and gazebos, table tennis and TV sat. The residence offers a modern furnished and equipped 2 room apartments of 40 m² with independent entrance, double bedroom, bathroom, living room with sofa bed and kitchen. The villa apartment offers 160 m² on two floors, elegantly decorated in Tuscan style with independent entrance, large living room with beautiful staircase, large fireplace, kitchen and sofa bed, two bedrooms on the first floor, 2 bathrooms each floor and a terrace with deckchairs and table. Studios with separate entrance made up of double bed + single bed, bathroom, kitchenette and private table and deckchairs outside. And two independent villas. We (2 adults, 2 teenagers) had a fantastic week at residence Oasis this summer. We were in a mini villa (not exactly a villa!) separate from the main building. We had our own private space with separate entrance and parking space. The setting was beautiful, the pool fabulous, clean and well maintained, surrounded by beautiful gardens. It's hard to entertain a 14 & 16 year old but the free wi fi, pool and table tennis table helped. Marco was really helpful with recommendations, restaurant bookings etc and always there if there was a problem. The local seaside town of San Vincenzo was really nice, lovely beach lots of good restaurants, this was a 5 minute drive. The village of Camipglia Marritimma was stunning, walkable in the day or 5 minutes drive. I wouldn't stay here to explore the touristy parts of Tuscany, ie Florence, sienna etc as they are a good 2 hours drive away but the local towns and countryside are beautiful. I would definitely recommend Residence Oasis to all. I travel a lot with my family and when i choose a place for holiday i am always worry.I take long time to check the price,quality and position.The Residence Oasis is perfect.Good price with a great quality,clean and nice position.we were in the big apartment 160m2. very big,spacious,old tuscan style forniture,large scale for the upper floor,many balconies,nice bathrooms,with a large garden for outside dining and barbecue.The place is quiet and you can relax with your family.The garden and the pool are fantastic,they make you happy.Flowers everywhere and large cork trees.The owners are friendly,helpful with many tips.You are in the middle of Tuscany so is easy to visit all the more important cities( Florence,Pisa,Siena,Rome). The sandy beaches are just 6km far and just walking 10 minutes we arrive at the medieval village of Campiglia Marittima with traditional restaurants and local shops,this village is a pearl. I recommend the Residence Oasis for a nice vacation.We will be back for sure. We were in this place in July with husband and 2 children - 7 and 14 years old. Apartments are nice, spacious and clean with kitchen equipment and great furniture, only bathroom was older but OK. Every apatment has separate entrance and terrace. In our app there wasn't aircondition but it wasn't neccesary. It is quite far from road so you can rest in silence. Garden is wonderful with really big pool and fountain, sunbeds and parasols, many large trees privides shade, flowers. Distance to public beach in San Vincezo is about 5 km but if you go 10 km the beach is better and without people (brown sand and great waves,free of charge). Nearest town 2 km on foot- small and nice with small good restaurants, nearest shop 3km -car recommended. Owners very nice, helpful and open. We will back for sure. Residence Oasis in the heart of Etruscan coast offers the opportunity to choose between a beach holiday: the sandy beach at San Vincenzo and Rimigliano Park equipped with picnic area and public beach and very close to the port of shipment for Elba Island. It is a cultural historic holiday, visiting local historic sites: Campiglia M.ma, San Gimignano, Volterra, Pisa, Siena, Florence and Rome. Golf: You have 2 golf clubs in the area. About 25 km from the Residence.